Do you only have 30 minutes a day to exercise? That may be all you need to keep yourself fit and healthy. Make the most of it by alternating activities. For optimum fitness, dedicate at least three weekly sessions to cardiovascular exercise, such as brisk walking, biking or aerobics. Two or three of your other 30-minute sessions should be devoted to weight training, Pilates or muscle toning, and at least one 30-minute session to stretching or yoga. Many videos feature several workouts in one video. 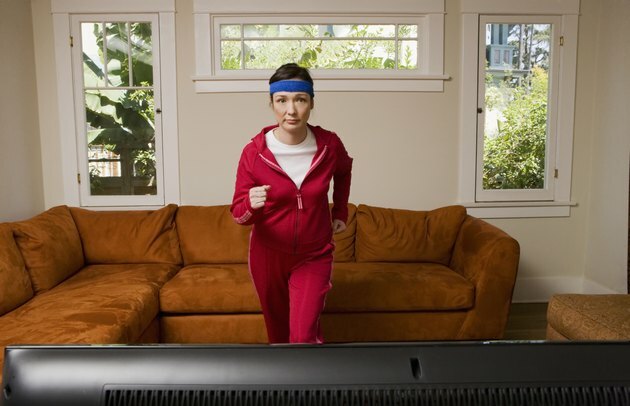 Keep it interesting by mixing short exercise videos into your workout routine. If you like pure cardio, try "Kelly Coffey's 30 Minutes to Fitness" series, including "Cardo Blast," "Kickboxing" and "Bootcamp." Each video offers two short workouts, with a fun mix of low and higher impact moves. "Core Cross Train Kickbox" offers four workouts on one video, each 13 to 26 minutes in length, starting with a beginner workout and ending with an advanced routine. "Tamilee's Tighter Assets Cardio Blast" will keep you revved for 34 minutes, starting with a fast-paced warm-up and moving into extra-intense cardio blasts. If you like non-dancy step aerobics, "Patrick Goudeau's Quick Step" will get your heart rate up for 33 minutes. Cathe Friedrich's "Basic Step and Body Fusion" offers two workouts and three "add-ons," including a a pure step aerobics workout (30 minutes), a step aerobics/toning interval workout (40 minutes) and three short toning segments, for a total body workout, all of which can be done separately. The "Zone Pilates Mat and Ball" exercise video offers three complete workouts--two stability ball programs, Pilates mat work and a 30-minute cardio workout using a stability ball. Jillian Michaels, star personal trainer from the hit reality program, the Biggest Loser, leads the "30 Day Shred" exercise video. It features three 27-minute workouts. Each workout alternates isolated strength training moves with athletic-style cardio. "Kelly Coffey's: 30 Minutes to Fitness" offers two 30-minute sculpting, weight room-style workouts with dumbells. She also offers a lower body workout entitled "30 Minutes to Fitness: Body Training," which works the lower body using no equipment. "Ilaria's Abs and Push-ups Plus" is short (28 minutes) but very tough. It alternates innovative abdominal exercises with pushups. "The Firm: Total Body Toner" offers a diverse sequence of body sculpting exercises for the whole body using only dumbbells, in under 40 minutes. If you enjoy Pilates, try the 35-minute "Element: Slim & Tone Pilates" video. Yoga can help you relax, strengthen, stretch and condition your body. The "15-Minute Results Yoga with Rodney Yee" features four 18-minute yoga workouts perfect for the busiest exerciser. "The Firm: Power Yoga" is a 33-minute workout that emphasizes stretching as well as muscle toning. Interested in pure stretch for flexibility? "Tamilee Webb's Total Stretch" offers two 30-minute soothing stretch programs filmed on beach for maximum relaxation. "Yoga Weight-Loss Workout for Dummies" is a straight-forward series of classic yoga poses delivered in less than 40 minutes.